On Thursdays over the summer, The Juice Online is going to highlight individual players on the 2015 Syracuse football team. This week, we’re profiling cornerback Julian Whigham. After a disappointing junior season, cornerback Julian Whigham didn’t mince his words. Whigham called the year a “waste” and has dedicated his final year in Syracuse to tapping his full potential and reviving his NFL dreams. It wasn’t for a lack of opportunity. Whigham started 11 games last season and squared off against elite receivers in the ACC. But at the end of the year, he recorded just 28 tackles, one interception, one fumble recovery and two pass breakups. In one particularly disappointing game against Duke, Whigham was burned twice for touchdowns as the Blue Devils defeated the Orange 27-10. Whigham will need to put all that behind him to have a successful senior season, and will also carry the additional role of being one of the few returning starters on defense. Syracuse head coach Scott Shafer also praised Whigham’s work ethic this spring, but stressed that there would be an open competition for the starting cornerback spots. While Whigham and Wayne Morgan have the most experience, Shafer pointed out that redshirt freshman Cordell Hudson and Juwan Dowels could crack the starting lineup. Inside slant: While the two redshirt freshmen show promise, the starting cornerback position is Whigham’s to lose. 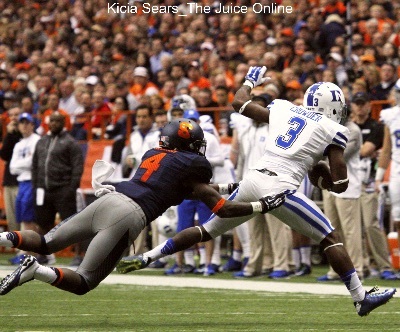 Shafer said that Whigham’s technique has improved, and that should help him improve on his disappointing 2014 season. Career highlights: Whigham has appeared in 32 games in his Syracuse career. Against Florida State in 2014, he recorded a career-best six tackles. 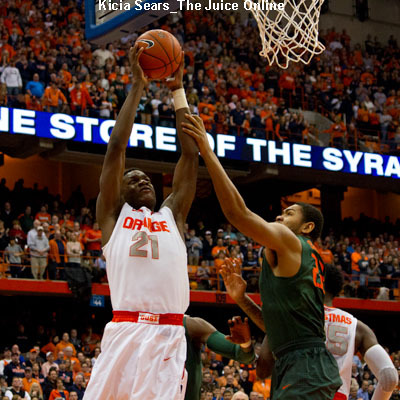 Is Syracuse forward Tyler Roberson more Hakim Warrick or Terrence Roberts?